Hurrah! 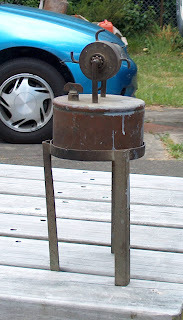 I have solved the mystery of what happened to Sir Frank Whittle's Hero steam engine, and I have been mowing my lawn. I like mowing my lawn: it makes me feel like a grown-up. You have to mow lawns in New Zealand. It is a national obsession. (Once walking deep in the bush I found five neatly mown bits of lawn, each fenced with chicken wire and laced with slug pellets. I called my companion over and he told me what the large leafy plant growing in the middle of each enclosure was.) I mostly mow my lawn with electricity, only straying onto the ride-on when it gets too long. We inherited the ride-on. It came with the house. It is a White Outdoor Product and if the global financial crisis has any silver linings, it will be the extinction of White Outdoor Products because they're crap. South Bend lathe? Excellent bit of American engineering. White Outdoor Product? Absolute shite. When each week she hears me maintaining my White Outdoor Product with a two-pound claw hammer my wife suggests I buy a new ride-on, but what does a ride-on accomplish? Short grass. Which you can more profitably obtain with a sheep. All the male New Zealanders I know talk longingly of Peak Oil so they can have a sheep instead of a lawn, but all their wives demur. Maud Lodge is one of the sheds, and it has a roofed passage between it and one of the other sheds, and it has a second passage behind it which, for want of a better term, we call Maud's Back - well anyway you've gathered that. My wife was aware that I was purchasing a shaper. She was aware that Nigel had saved it from being sold as scrap iron to China. She was not fully aware of what a shaper is, nor how big it is, but by means of the above photograph she has been introduced to these concepts and now I have to win her round by assuring her that I can use it to repair the White Outdoor Product, which will be a lie. It can't. *Nothing* can repair a White Outdoor Product. The shaper is mine, technically, because I now own it, but it is displaced 25 miles to the right, there being a geographical discrepancy between my shed and Nigel's back yard. How I get it here is going to be the difficult bit. It is, as you see, balanced on a pallet and wedged with a piece of marble. I do not like to ask whence the marble. It looks like it was stolen from a cemetery. And from among his junk on a shelf this afternoon, Nigel plucked a small Hero steam engine and handed it to me. 'Know what that is?' he asked. The neighbour had been a friend of Whittle. You would have thought being given a jet engine hand-made by him was pretty exciting but the neighbour happened to be an Army major, unusual in achieving retirement age because he was a bomb disposal officer, and for him excitement was probably the fact that he got home for tea each day. 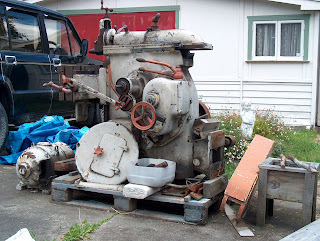 Anyway he handed this to Nigel and so if you've been wondering where Sir Frank's demonstration Hero steam engine went, it's in a shed in the Nelson region of New Zealand. And if, instead, you were looking for the Red Baron's flying boots, they're in Blenheim, just over the ranges. The air museum advertised that they possessed only the one boot, and that not properly provenanced, and presently got a parcel in the post from a lady in Australia who said her father had brought it back as a trophy after the first world war. It was an exact match to the one the museum already had.